Adobe Muse and Wix are popular website building solutions, which differ in terms of complexity, functionality, objectives, pricing policy, target audience and general approach to the web design process. The systems make it possible to create different types of websites, from simple landing pages and up to more complex and feature-rich business websites, portfolios and even online stores. Adobe Muse – is a powerful website builder, which is mostly focused on the needs of designers, who have an intention to launch large-scale and appealing websites without the need to fight with complex codes. The use of the system implies the knowledge of basic web design nuances yet it’s not too complicated to be used by newbies. Wix – is currently the most popular and feature-rich website builder available in the contemporary web design market. It can boast more than 130 millions of subscriptions in over 190 countries of the world. The service encompasses such advantages as ease-of-use, convenience, affordability and intuitive nature. You don’t need to have good command of programming languages to design different types of websites with the platform – so simple and understandable it is. Adobe has recently announced the upcoming termination of Muse support. On March 26, 2018, the system developers have issued the final set of Adobe Muse updates. This means that existing users will now be able to work with the program without an opportunity to turn for customer support assistance. This, however, is a notable disadvantage for the system users. 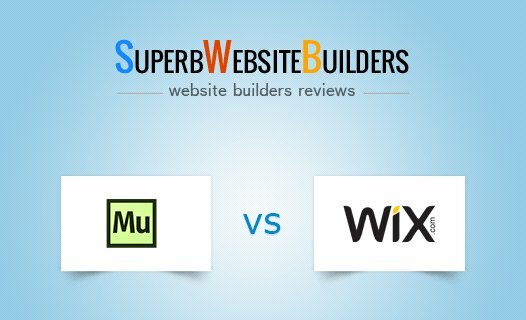 Thus, it makes sense to read our review and choose between Wix vs Adobe Muse – either to use the old program version or a modern website builder. Adobe Muse. As far as the website builder is initially focused on the needs of professional web developers, this user category will find the system quite convenient and understandable. Those users, who have ever worked with Adobe products (like Photoshop or Illustrator, for example), won’t have problems mastering the system as well. For the beginners, however, Adobe Muse may seem somewhat intricate and not quite simple, especially at first sight. This is because the system implies preliminary graphic design expertise. As you start exploring the service, you will quickly learn its parameters and features to further use them to the advantage. The platform uses drag-and-drop editing basics to simplify the web design process and let users have full control over it. Wix. This is one of the simplest and user-friendly website builders you can come across nowadays. The system is geared towards the requirements and skills of beginners and, thus, offers intuitive, simple and convenient web design experience. Whether you need to add a widget to your website, change the background or attach a domain name, everything is done via a user-friendly interface that requires no coding at all. Wix comes with a drag-and-drop editor providing extensive WYSIWYG options. It puts a user in charge of the web design process, making it possible to watch the progress in action and fix the apparent mistakes on time. Adobe Muse vs Wix. 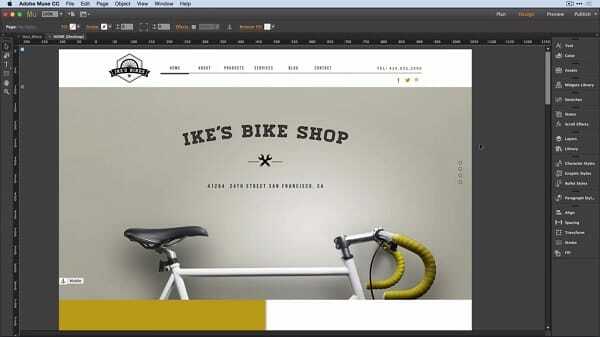 Both Wix and Adobe Muse are easy, if used by their target customers. Adobe Muse is ideal for those who are familiar with Adobe’s ecosystem, while Wix is geared more towards the regular user. This is what makes it a better choice both for inexperienced and proficient web designers. Adobe Muse. Muse is very much a design-based site builder, so its feature set is mainly built around design features. Offering a stunning design toolkit, the system still lacks those interactive features found in Wix, Weebly and other all-in-one website builders. To start building a website with Muse, you should initially create the site map and then proceed to Master Page design. Mind that all the design elements and sections you will create here will be automatically applied to the rest of pages. This is a convenient and time-saving solution. As soon as you are done with your web page layout development, you may proceed to the addition of widgets. The system has integrated marketplace where you can browse free and paid widgets exclusively developed for Adobe Muse. All the widgets and add-ons are configurable to match your website style in the best way possible. The widgets are also responsive by default, which makes it possible to create flexible website design that will also feature decent quality, functionality and content presentation. Adobe Muse is also known for its advanced Copy and Paste Attributes. The feature makes it possible to copy and then paste the major design attributes (fill color, opacity, font etc.) from one website element to another. This eventually helps cut down the final time of website development. Among other features and tools that make Adobe Muse a decent solution for web designers, it makes sense to mention text synchronization options, availability of multiple premium web fonts from self-hosted and Typekit font collections, eCommerce and blogging options, abundant image editing tools, right-to-left language support and more. Wix. Wix abounds in features and tools users can apply to create impressive, full-fledged and functional websites. It doesn’t matter what project exactly you plan to develop, doing that with Wix won’t cause any problems at all. Newbies will certainly benefit from working with Wix ADI tool. The Artificial Design Intelligence feature will let you launch a decent website from scratch in the automated mode. What you need is to upload your web store parameters and required content to let the system do the rest for you. If you wish to add unique features to your website, you can make use of the standard Wix editor to manually adjust the settings, modify the design and set up the required parameters. This option requires more effort and time investment but the result will be certainly worth that. Apart from that, Wix allows customizing the mobile version of your website by making use of the Mobile Editor. It should be mentioned that the changes you make in the mobile editor are not displayed in the desktop version of your website. At the same time, the edits you make in the desktop mode can be viewed in the mobile version. 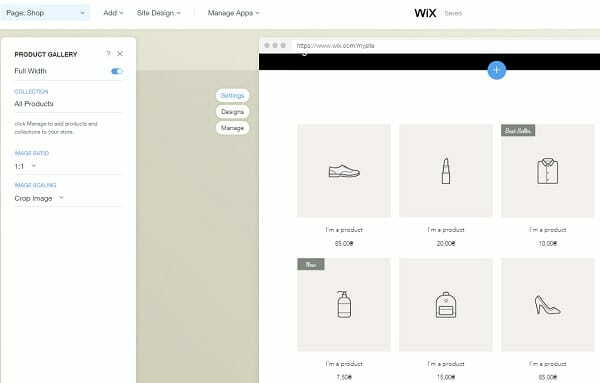 The prevailing amount of Wix features are integrated by default, but users can also get access to third-party extensions and widgets available in the Wix App Market. This is where you may come across multiple free and paid widgets to be added to your website to boost its performance and drive more traffic to it. Wix is also known for its powerful blogging and eCommerce engines. By using the system, you will be able to launch a small-to-mid online store and a blog. What’s more, there is a free opportunity to connect a forum to your website. This will surely contribute to your website performance. Adobe Muse vs Wix. When it comes to the feature set, Wix is definitely the leader of the comparison. The website builder grants access to multiple tools, features and operates as an all-in-one system, where you can get everything you need for a website under the same roof. Adobe Muse doesn’t provide that streamlined workflow, and operates more as a separate web design studio. Adobe Muse. The website builder itself doesn’t have a gallery of ready-to-use themes. To create and customize your own template, you should select the black canvas and start editing it as you wish by changing header, footer, buttons, navigation menu and other elements. This is hardly a problem for web designers, but this may be a challenge for newbies. Fortunately, you can find many online resources that are fully dedicated to the development of Adobe Muse templates. The most reliable ones are featured on the official website of the service. Some of them include Muse-Themes, MuseFree, Musegain, and MuseGrid to mention a few. Mind that you should beware of buying or downloading Muse templates from the untrusted designers as well as from those you don’t known at all. The thing is that some of them may come with malicious codes that may pose threat to your website safety and confidentiality of data provided. Wix. 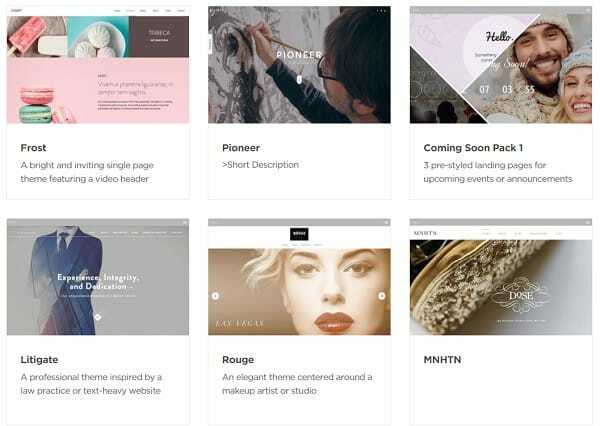 Wix abounds in templates – there are more than 550 themes available for customization here. The templates are mobile-ready and they are subdivided into dozens of categories based on the topics they are related to. Mind that you should be very attentive, when selecting the template for customization as the system doesn’t allow switching the templates midway through the web design process. Apart from ready-made themes, you can choose a blank template to start a website from scratch and manually customize it with regard to your needs. This is how you can create unique website design to cover the entire spectrum of your web building requirements and preferences. Adobe Muse vs Wix. 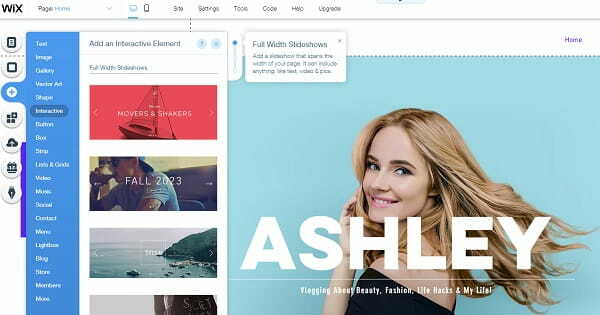 Being a one-stop-shop product, Wix has a rich integrated template library. Whatever niche you specialize in, you will surely find a suitable design here – so versatile the collection is. Wix also comes with multiple design customization options and tools that make it possible to create any project. Muse doesn’t offer ready themes, as professional designers doesn’t work that way – they prefer creating websites from a blank canvas. Adobe Muse. There’s a huge community of designers built around Adobe Muse, though it’s a comparatively new product. The knowledge base of the service is quite extensive. Other support options currently include chat, forum, webinars, video walkthroughs and also phone support, depending on your plan. Mind, however, that tech support service for current Creative Cloud users will be unavailable after March 26, 2020. Wix. The website builder has a user-friendly interface that contains multiple prompts, tips and cues on how to use the system to the advantage. Nearly every button in the control panel comes with a help icon. That’s really handy. If you can’t find the answer in the editor, you can go to the official forum or support center. Wix also has a great collection of video tutorials and email support. Users can get access to the extensive knowledge base with lots of step-by-step tutorials, how-to videos and informative articles written in a simple and understandable language. Wix vs Adobe Muse. In our opinion, both website builders offer enough customer support resources. When testing the products, we also paid attention to the support centers and the speed of reaction they demonstrate. We were impressed at how many people participated in their forums. Wix customer support options, however, are still a bit more versatile, which is another advantage of the system. Adobe Muse. As far as the system does not provide customer support assistance to Muse users anymore, it has made it possible for them to consider switching to other Adobe programs that work best for their particular web design needs. These include Adobe XD for website template designers (the cost constitutes $9.99/mo or $119.98/year), Adobe Portfolio for the development of portfolio projects (the cost is $9.99/mo) or Adobe Spark for the creation of landing pages (the cost is $9.99/mo or $99.99/year). Mind that not all Adobe Muse widgets are offered for free. You can choose between free and paid options based on your current requirements. There is also one important aspect you should be aware of, when building a website with Adobe Muse. As soon as your project is ready for publication, you can choose between two hosting options (the website builder doesn’t offer integrated hosting by default). You can either host the project with Adobe or look for the third-party hosting provider anywhere on the web. This will require extra financial investment. Wix. Wix has a free, never-expiring version and five paid plans that range from $4.50 to $24.50/month. Please note that the cheapest plan – ‘Connect Domain’ – displays Wix advertisement. Even though, paid plans differ in the range of features and services offered, each of them comes with integrated hosting and domain connection option. Premium plan subscribers are offered free domain name as a bonus at no cost at all granted that they purchase the annual subscription. This is an undeniable advantage of the website builder most users appreciate, when choosing the service to work with. Widgets available in the App Market can also be paid and free. If there is something, you don’t like about the system for some reason, you can get the money refund during 14 days after you make the payment. In this case, however, you’ll get back to the free plan, while your content will be left unchanged. Adobe Muse vs Wix. Both website builders are reasonably priced. The advantage of Wix is that its plans cover hosting. It also offers more paid options users may choose from based on their needs. At the same time, absence of hosting and limited pricing solutions are the disadvantages of Muse. To sum it up, Wix offers more versatile and affordable pricing policy than Adobe Muse. Adobe Muse and Wix are very different products despite the shared goal. They utilize quite different approaches to the process of website building, price formation, choice of the target audience and feature set. Having completed the comparison of both systems, we can conclude that Wix is a more beneficial solution for regular users, who are not aware of complex web design basics. Adobe Muse is an offline website builder, the range of features of which is centered around the development of quality professional websites. The service works best for experienced web designers, who are competent in the niche and don’t need time to fight with complicated codes. Wix is a popular all-in-one website builder, which comes with extensive set of features, quality customizable templates and versatility of pricing options. There is no need to be a coding expert to design different types of websites with the system. This is what makes it a great choice for beginners, who are just on their way to web design success. Adobe Muse is mainly geared towards the needs of professional web developers and it also requires coding knowledge. The platform doesn’t offer integrated hosting, forcing users to look for the provider elsewhere. This eventually proves to be extra time and effort investment. An important aspect is that Adobe Muse users won’t be able to use customer support assistance after the termination of the support service. This is a huge drawback for all the users, especially for those, who have just joined the system or plan to do that. The best solution to the problem is switching to another platform, which will encompass ease of use, convenience and decent customer support assistance for everyone, who needs it.